KALAMAZOO, MI. 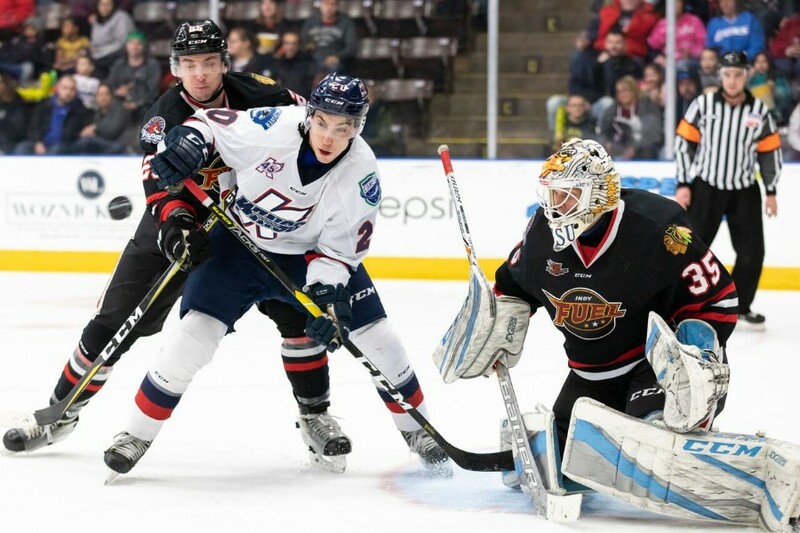 – Three goals in the third period helped Kalamazoo (20-20-0-2) to a come from behind victory over the Indy Fuel (22-19-2-1) at the Wings Event Center in the second of the home and home series on Sunday afternoon. Brett Welychka tallied his 10th goal fo the season within the first five minutes of the first period to give Indy an early lead. Kevin Dufour passed the puck from behind the net to Welychka who zig-zagged the puck and lifted it to the right top corner of the net over goaltender Jake Hildebrand’s shoulder. Halfway through the first Kalamazoo won a faceoff that allowed Saar to take a slapshot from the blue line that passed by goalie Gordan Defiel. Defiel made his debut for the Fuel tonight after being acquired on a trade with the South Carolina Stingrays for future considerations earlier this week. Logan Nelson tallied a power-play goal for the Fuel at 19:35 to give the Fuel a 2-1 lead that would last throughout a scoreless second period. Less than two minutes into the third period Reid Gardiner diverted the puck from the right circle to Tanner Sorenson in front of the net and buried it in the net to tie the score at 2-2. The Fuel gained their second power-play goal of the night when Nelson took a shot from the boards that bounced off of Hildebrand’s pads where Matt Rupert was waiting to rebound the puck to give the Fuel a one-point lead once again. However, the Wings proved resilient when they won a face-off in the right circle where Tyler Ganely took the slapshot that was blocked by Defiel, recovered by Brendan Bradly who passed it behind his back to Kyle Thomas who tapped the puck in to tie up the score at 3-3. Wings sealed the deal with five minutes left to go in the third when Chad McDonald rotated himself around Zach Miskovic for a diving shot that was tipped in by Saar into the net for a final score of 4-3. Fuel finished 2-for-4 on the power play while Wings finished 0-for-3. In his debut, Defiel had 31 saves on 35 shots and Hildebrand had 28 saves on 31 shots. Indy picks up four points this weekend with wins against the Fort Wayne Komets on Friday and the Kalamazoo Wings on Saturday. The Fuel travel to play the Wheeling Nailers on Friday, February 1st at 7:05 pm at Wesbanco Arena.